Our communities are our greatest assets. We don't just focus on stores and hours. We connect with customers, local business owners and our neighbors in meaningful activities that improve the community and make sure that our business reflects the communities we serve. TD Bank has built its success by embracing and celebrating the diversity of all customers, employees and suppliers—and our commitment to diversity continues to grow. We provide our diverse customer base with the same quality experience across the board through multilingual services and materials as well as ongoing improvements to the accessibility of our stores. We want to serve as an example to others, investing in community programs to promote, celebrate and recognize diversity. Our North American Supplier Diversity Program creates a level playing field for diverse suppliers, aligns with TD's focus on employee and community diversity, and supports our corporate objective of being the better bank. At TD Bank, diversity is not a program or a policy. It's part of our DNA. We care just as much about being a supportive place for our employees to work and a comfortable place for customers to bank. We are committed to being active members of the communities we serve. We believe that TD's commitment to diversity is not only the right thing – it's critical to achieving our mission to be a leading North American bank. Our success depends on reflecting the communities and cultures where we do business. Our mission is clear: to be the best-run, customer-focused, integrated financial institution, with a unique and inclusive employee culture. We invite you to experience TD Bank soon. 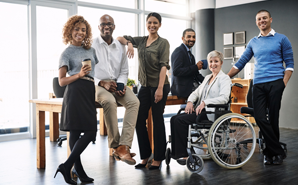 As the head of TD Bank's Diversity Leadership Team (DLT), I take pride in working for a company that cares deeply about fostering a diverse and inclusive culture. This goes hand-in-hand with our belief that banking should be about more than making money–it should also be about enriching the lives of our customers, colleagues and communities. Respecting and honoring our differences is part of TD Bank's DNA. But we take it one step further. We believe it's important to embrace our shared experiences, too. We've learned that diversity and inclusion enable each individual to achieve his or her full potential while helping us achieve our common mission of enriching the lives of our customers, colleagues and communities. When people connect to their community, good things happen. Our volunteer culture engages our employees, inspires our neighbors to roll up their sleeves and enriches us all. Financial education: TD Bank volunteer instructors lead in-person financial education classes to help make financial literacy accessible for all. TD Tree Days: Tree-planting events give employee volunteers and community members the opportunity to get actively involved in their local communities while helping to create a greener and healthier environment in underserved urban areas. Pride celebrations: Each year, employee volunteers engage more than 3 million individuals in Pride events across the communities where we live, work and play. Our #ForeverProud theme encourages people to celebrate Pride and individuality–every day of the year. TD Bank Special Olympics Campaign: Since 2009, the annual TD Bank Special Olympics fundraising Campaign has engaged employees, customers, friends and family in raising money and awareness for Special Olympics. 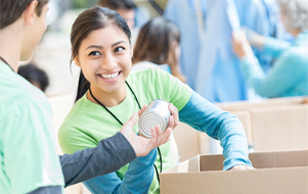 TD Employee Giving Campaign: As part of our annual Employee Giving Campaign, TD Bank's employees contribute millions of dollars to the registered charities that matter most to them.